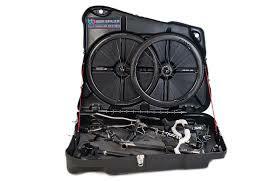 TriHarman-Norfolk members can take advantage of cheap bike box hire if you are travelling away to train or race. We have two hard bike boxes which easily pack a road bike with minimum of dismantling. The boxes are a great way to ensure your bike gets there and back undamaged as the boxes are designed to take the common abuse of the baggage handling systems with a hard shell and anti crush bars. They are available for £25 per week, a significant reduction on commercial hire outlets. You will need to ensure the bike and box are covered by your travel insurance in case the worst happens. If you are interested contact us to discuss or book a box.